I read a lot. In fact, I've probably read at least 40-50 books since we left on this trip...I love to read, and if I've got a decent book in my hand - I'm good to go. Susan Casey's "The Wave" is, quite simply, a book about waves. Specifically (as her sub-title explains), it's about the "rogues, freaks and giants" of the ocean. Some sailors might not want to read about waves that have swallowed entire container ships and may feel better not knowing the figures of exactly how many boats are "lost at sea" (most likely due to rogues), but for some reason these sorts of books don't bother me. Knowledge is power people. 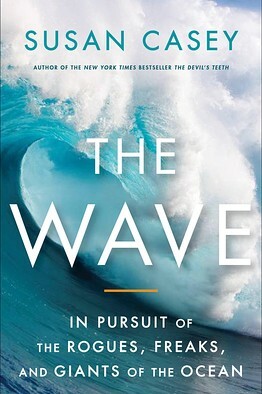 First of all, Casey takes what could have been a dry and dull science book and creates a vivid and "gnarly" page-turner by looking to the people who know these waves best: mariners, oceanographers, and big-wave surfers (Laird Hamilton, in fact, could be considered a "main character" in this narrative). In between her interviews with these experts she hops back and forth in time, weaving seamlessly between modern day knowledge and ancient lore. Haunting stories of ships being snapped in half by waves as big as office buildings, unbelievable stories of entire mountainsides cleared of trees by 100 foot freaks and harrowing accounts of tow-surfers who paid the ultimate price for the "ultimate wave" pepper the pages of this book. These tales of survival and tragedy at the slippery hands of the sea are all equally gripping and incredibly humbling. Casey writes in such a way that not only can you adequately grasp the science behind the maelstrom, but you can almost feel the power and magnificence of these walls of water as if you were surfing right alongside her. Not an easy feat. Her research takes her from Hawaii, to London, from Tahiti to South Africa, from San Francisco to Baja and all of it points to one, definitive conclusion: big waves (and I mean of the 80-120 foot variety) DO exist, and - if climate change and global warming continue at the current pace - they're only going to get bigger, uglier, and deadlier. It's not a question of if, it's a question of when. If you love the ocean, if you are passionate about the environment or mystified by the sea - read this book. Whether you observe them from the beach or choose to ride them on a boat or a board "The Wave" will enchant you. It is as powerful and gripping as the monsters it seeks...Hang ten, my friends. Labels: adventure, books, cool stuff, protecting the oceans, quotes, who knew? I bought it on my Kindle and have found it wonderfully addictive. She does a good job weaving the complex science of waves with some surfer stories.